Enjoy regional and national bands at the coolest outdoor venue in Northwest Wisconsin! Concerts are every Friday from Memorial Day thru Labor Day and a few extra nights, just for good measure. The Shed is family friendly, so bring the kids and a your own chairs, if you choose. Doors open at 6pm for pizza, snacks, desserts, and the best craft beer and wine selection in the area. Music starts at 7pm. Indoors if raining. The Shillelagh Lads are an Eau Claire, Wisconsin based band that focuses on providing audience members with a dynamic, spectacular traditional Irish show, all in a community centered, pub-like arena. Voted "Best Folk Performers of 2012" by Volume One Magazine's Reader Poll. They may perhaps be the most enjoyable, fun, and engaging show you will see this year. Enjoy regio nal and national bands at the coolest outdoor venue in Northwest Wisconsin! Concerts are every Friday from Memorial Day thru Labor Day and a few extra nights, just for good measure. The Shed is family friendly, so bring the kids and a your own chairs, if you choose. Doors open at 6pm for pizza, snacks, desserts, and the best craft beer and wine selection in the area. Music starts at 7pm. Indoors if raining. 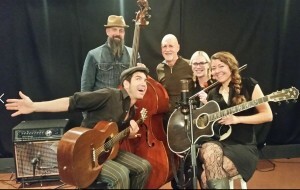 Driving gypsy jazz rhythms, acoustic guitars, upright bass and violin lay the foundation for mesmerizing vocal harmonies and fantastic stories. It's theatrical and humorous. It's musical and intense. It entertains, dazzles and defies classification while welcoming the spectator to join the band throughout the performance in momentary fits of claps, snaps and sing-alongs. If Django Reinhardt, the cast of Stomp and the Beatles all had a party at Tim Burton's house, Caravan of Thieves would be the band they hired.